Alex Province and his spouse Matthew Bennett, like the rest of us, often rely on Ina Garten’s books and watch her television show with keen interest. Matt follows her instructions to the letter, and Alex uses her recipes as a guide, tossing in whatever strikes him at the moment. We knew we had to ask Alex to somehow convince busy Matt to whip up Ina’s Parmesan chive smashed potatoes on a weeknight. We held our breath, but sure enough, Alex came marching in with a, well, to be candid, a small tray of crisped red potatoes, cheese melted on top, and scattered with green chives. Were they good! But when I scanned the horizon for an extra serving, Alex looked slightly sheepish; that’s when I realized what the guys had for dinner the night before. They were even fantastic 24 hours later and reheated—something of a miracle. These would work well for the upcoming holidays, and like everything in Ina’s new book, Make It Ahead, you’ll have time to sit back and enjoy your company, unless you find the food too irresistible before it gets to the table. That can happen. Recipe from Make It Ahead: A Barefoot Contessa Cookbook by Ina Garten, Copyright © 2014 by Ina Garten. Photographs by Quentin Bacon. Published by Clarkson Potter/Publishers, a division of Penguin Random House, LLC. 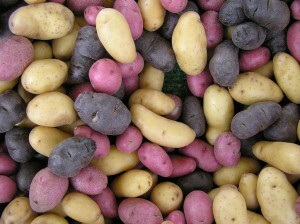 Place the potatoes and 1 tablespoon salt in a large saucepan and add enough water to cover the potatoes. Bring to a boil, reduce the heat, and simmer for 17 to 20 minutes, until the potatoes are tender when pierced with a skewer. Drain the potatoes and place on a sheet pan. With a potato masher or metal measuring cup, press each potato until it's about ½ inch thick ( they will be messy). Toss the potatoes with the olive oil, 1 teaspoon kosher salt, and ¾ teaspoon pepper. Roast the potatoes for 25 to 30 minutes, turning once, until the skins have become nicely browned. Sprinkle the potatoes with the Parmesan cheese and roast for another 2 to 3 minutes, just until the cheese melts. Sprinkle the potatoes with the chives and fleur de sel and serve hot. How do you store them and up to how long? Doug…..do not fret. I stored them in my fridge overnight and heated them up the next day. Miracle of miracles….. they were great! We just placed them in one of those restaurant to go containers and stored them overnight. The next day Chris reheated them in the oven on a baking tray until piping hot.